Â© Tamara Voninski. Ahipara, New Zealand. 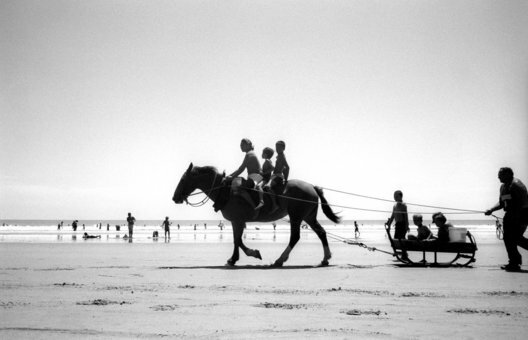 Maori children ride a horse and sleigh across the sand at the southern end of Ninety Mile Beach at Ahipara (North Island) New Zealand. In Maori legend, the spirits of the dead depart the earth along this beach. The New Zealand government had proposed laws to prevent Maori from claiming ownership of the coastline and seabed in New Zealand. 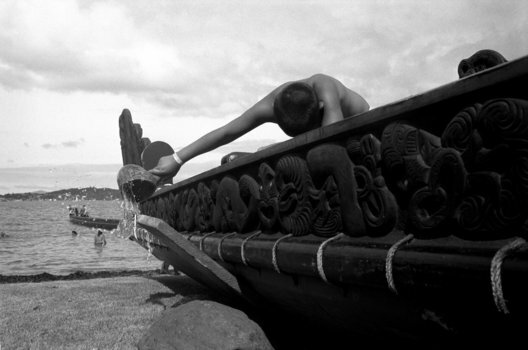 Tamara Voninski/ oculi/ Vu Aotearoa 2005 Waitangi, New Zealand A boy pours water out of the traditional waka war canoes in prparation for a voyage near Waitangi, New Zealand. In 2005, the New Zealand government passed the controversial Seabed and Foreshore legislation to prevent Maori from claiming exclusive ownership of New Zealands resource rich coastline and seabed. The Maori traditionally see themselves as caretakers of the land and coastline. The Maori population is approximately 530,000 of four million New Zealanders. Â©Tamara Voninski. People on the beach in Paihia, New Zealand in the Bay of Islands. In 2005, the New Zealand government passed the controversial Seabed and Foreshore legislation to prevent Maori from claiming exclusive ownership of New Zealand2019s resource rich coastline and seabed. The Maori traditionally see themselves as caretakers of the land and coastline. The Maori population is approximately 530,000 of four million New Zealanders. Â©Tamara Voninski. 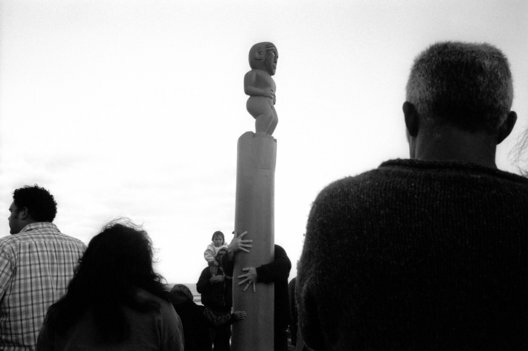 Maori people gather at Ahipara Beach , the southern end of Ninety Mile Beach, in New Zealand to dedicate a pouwhenua (marker pole). The Pouwhenua symbolizes the long-standing relationship that the Maori people have with land including the adjoining foreshore and seabed. 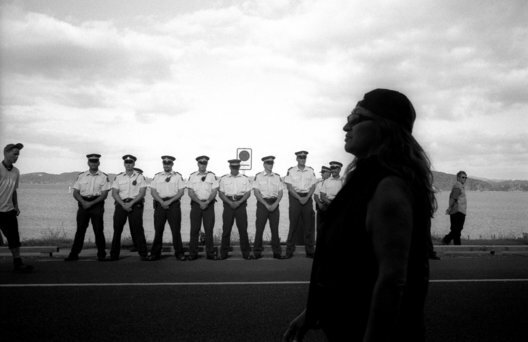 The ceremony marks traditional ownership rights of the Maori people. In Maori legend, the spirits of the dead depart the earth along this beach. In 2005, the New Zealand government passed the controversial Seabed and Foreshore legislation to prevent Maori from claiming exclusive ownership of New Zealand2019s resource rich coastline and seabed. The Maori traditionally see themselves as caretakers of the land and coastline. The Maori population is approximately 530,000 of four million New Zealanders. Â©Tamara Voninski. 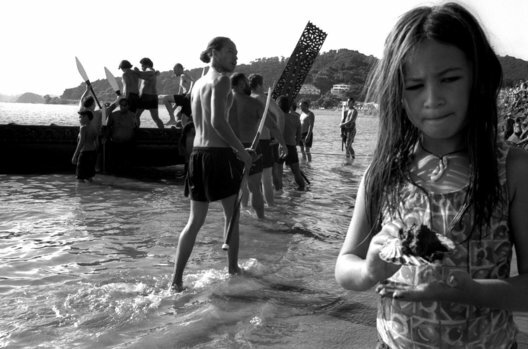 A Maori girl gathers shells and sand along a beach near Paihia in the Bay of Islands in New Zealand as men go out on a waka, a traditional launch of a war canoe. In 2005, the New Zealand government passed the controversial Seabed and Foreshore legislation to prevent Maori from claiming exclusive ownership of New Zealand2019s resource rich coastline and seabed. The Maori traditionally see themselves as caretakers of the land and coastline. The Maori population is approximately 530,000 of four million New Zealanders. Â©Tamara Voninski. 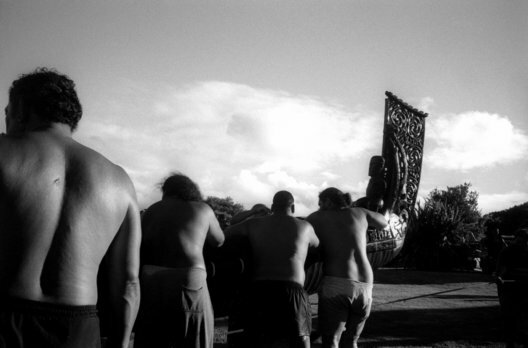 Maori men prepare for a traditional waka, war canoe, near Waitangi, New Zealand. In 2005, the New Zealand government passed the controversial Seabed and Foreshore legislation to prevent Maori from claiming exclusive ownership of New Zealand2019s resource rich coastline and seabed. The Maori traditionally see themselves as caretakers of the land and coastline. The Maori population is approximately 530,000 of four million New Zealanders. Â©Tamara Voninski. Protesters climbed a very tall 100m Norfolk Pine Tree to raise the Maori Sovereign flag higher than the New Zealand flag and flagpole at the Treaty grounds at Waitangi on Waitangi Day. 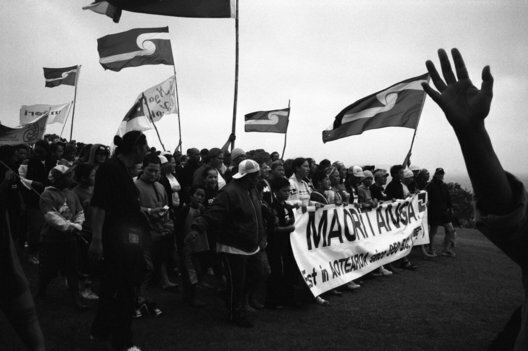 Every year Maori protesters find an ingenious way to raise their flag as high as possible. A few years ago, protesters used a kite to fly their flag. In 2005, the New Zealand government passed the controversial Seabed and Foreshore legislation to prevent Maori from claiming exclusive ownership of New Zealand2019s resource rich coastline and seabed. The Maori traditionally see themselves as caretakers of the land and coastline. The Maori population is approximately 530,000 of four million New Zealanders. Â©Tamara Voninski. 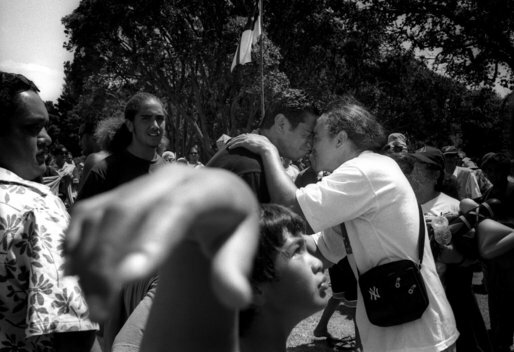 Maori men greet each other with a hongi, a traditional greeting pressing noses together ,on Waitangi Day (New Zealand's National Day) in the Bay of Islands in New Zealand. Â©Tamara Voninski. 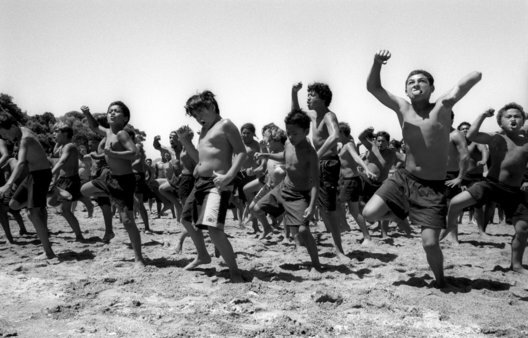 Maori boys perform a Haka, traditional war dance for men who were launching a Maka, traditional war canoe in Waitangi, New Zealand on Waitangi Day. 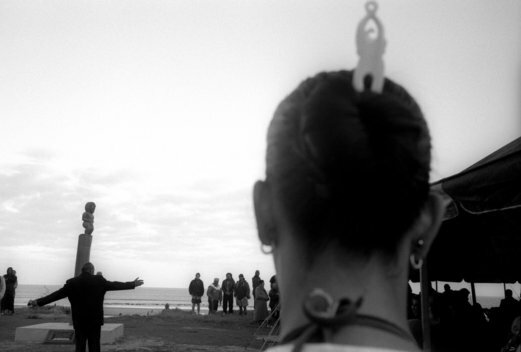 There is currently a renaissance of traditional Maori culture in New Zealand. Maori children are taught their language and customs by elders. In 2005, the New Zealand government passed the controversial Seabed and Foreshore legislation to prevent Maori from claiming exclusive ownership of New Zealand2019s resource rich coastline and seabed. The Maori traditionally see themselves as caretakers of the land and coastline. The Maori population is approximately 530,000 of four million New Zealanders. Â©Tamara Voninski. 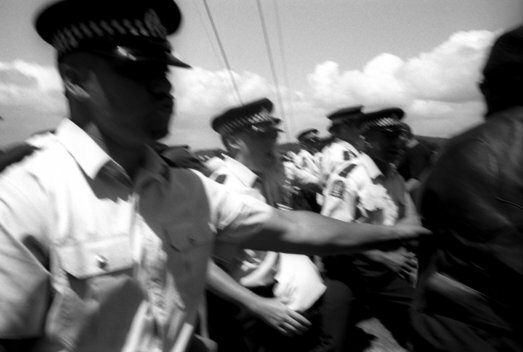 New Zealand police move in on a group of Maori protesters shouting abuse on Waitangi Day (New Zealand's National Day) in the Bay of Islands in New Zealand. The Treaty of Waitangi was signed in 1840 between the Maori and the British who agreed to live together peacefully. In 2005, the New Zealand government passed the controversial Seabed and Foreshore legislation to prevent Maori from claiming exclusive ownership of New Zealand2019s resource rich coastline and seabed. The Maori traditionally see themselves as caretakers of the land and coastline. The Maori population is approximately 530,000 of four million New Zealanders. Â©Tamara Voninski. Policemen gather near a church where New Zealand Prime Minister Helen Clark was meeting with Maori elders to discuss proposed changes to legislation regarding Maori rights regarding the coastline and seabed in New Zealand. Protesters later heckled the Prime Minister for turning her back on the Maori people and the original Treaty of Waitangi. In 2005, the New Zealand government passed the controversial Seabed and Foreshore legislation to prevent Maori from claiming exclusive ownership of New Zealand2019s resource rich coastline and seabed. 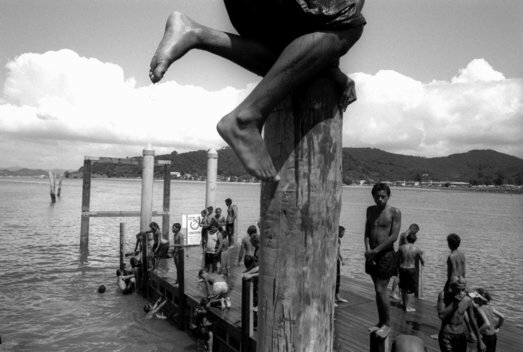 The Maori traditionally see themselves as caretakers of the land and coastline. The Maori population is approximately 530,000 of four million New Zealanders. Tamara Voninski/ oculi/ Vu Aotearoa 2005 Waitangi, New Zealand Maori people march in a hikoi protest on the Treaty of Waitangi grounds in New Zealand. In 2005, the New Zealand government passed the controversial Seabed and Foreshore legislation to prevent Maori from claiming exclusive ownership of New Zealands resource rich coastline and seabed. The Maori traditionally see themselves as caretakers of the land and coastline. The Maori population is approximately 530,000 of four million New Zealanders. Â©Tamara Voninski. 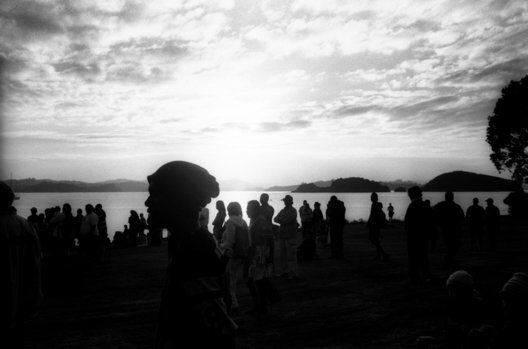 Maori people gather in Waitangi for a dawn service on Waitangi Day (New Zealand's National Day) in the Bay of Islands in New Zealand. The Treaty of Waitangi was signed in 1840 between the Maori and the British who agreed to live together peacefully. In 2005, the New Zealand government passed the controversial Seabed and Foreshore legislation to prevent Maori from claiming exclusive ownership of New Zealand2019s resource rich coastline and seabed. The Maori traditionally see themselves as caretakers of the land and coastline. The Maori population is approximately 530,000 of four million New Zealanders. Tamara Voninski/ oculi/ Vu Aotearoa 2005 Waitangi, New Zealand A man stands guard over the traditional waka canoes during the Waitangi Day celebrations in New Zealand. In 2005, the New Zealand government passed the controversial Seabed and Foreshore legislation to prevent Maori from claiming exclusive ownership of New Zealands resource rich coastline and seabed. The Maori traditionally see themselves as caretakers of the land and coastline. The Maori population is approximately 530,000 of four million New Zealanders. Â©Tamara Voninski. 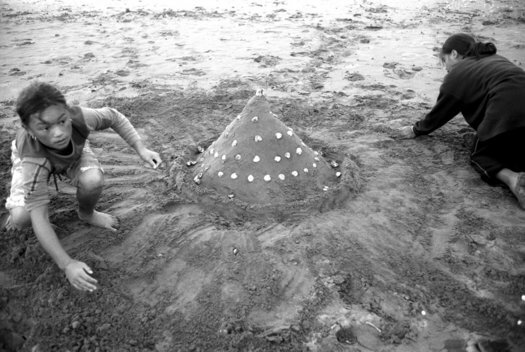 Maori children build a sand castle with shells from a beach near Waitangi in the Bay of Islands in New Zealand. 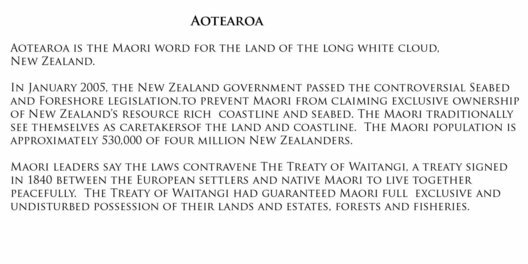 The Treaty of Waitangi was signed in 1840 between the Maori and the British who agreed to live together peacefully. In 2005, the New Zealand government passed the controversial Seabed and Foreshore legislation to prevent Maori from claiming exclusive ownership of New Zealand2019s resource rich coastline and seabed. 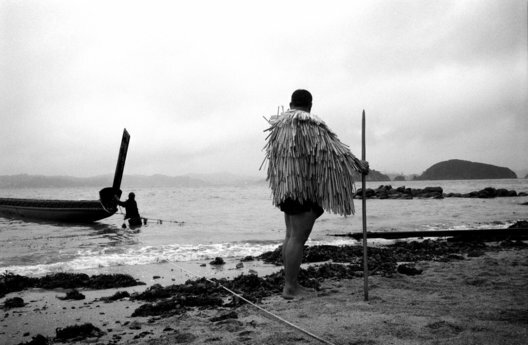 The Maori traditionally see themselves as caretakers of the land and coastline. The Maori population is approximately 530,000 of four million New Zealanders.